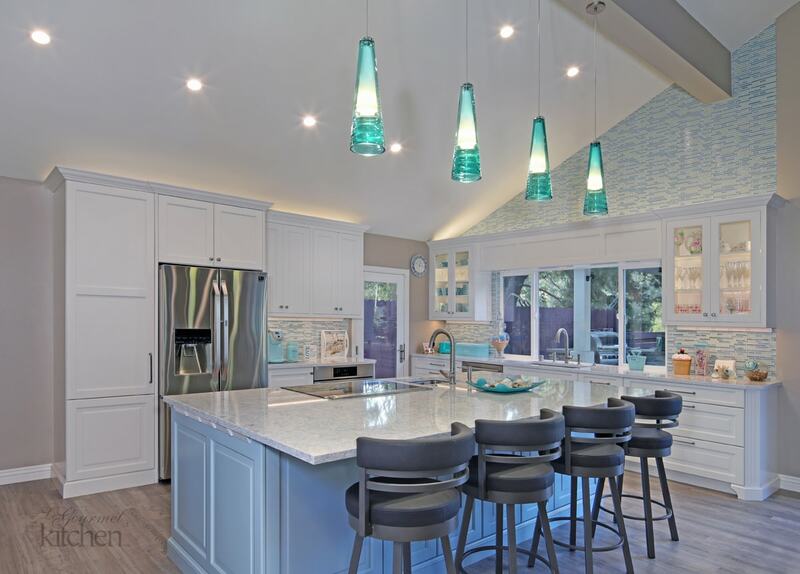 Entertaining Islands for Your Orange County Kitchen Design | Le Gourmet Kitchen Ltd.
We’re in the throes of holiday season, which means many of us are preoccupied with planning gatherings for family and friends. It’s the most wonderful time of the year and your parties will go off without a hitch if your kitchen is up to the task. Today’s kitchen designs usually center on an island and this is for a reason. As well as meeting everyday practical requirements, read on to find out how this invaluable element of your kitchen remodel can take care of all your entertaining needs. 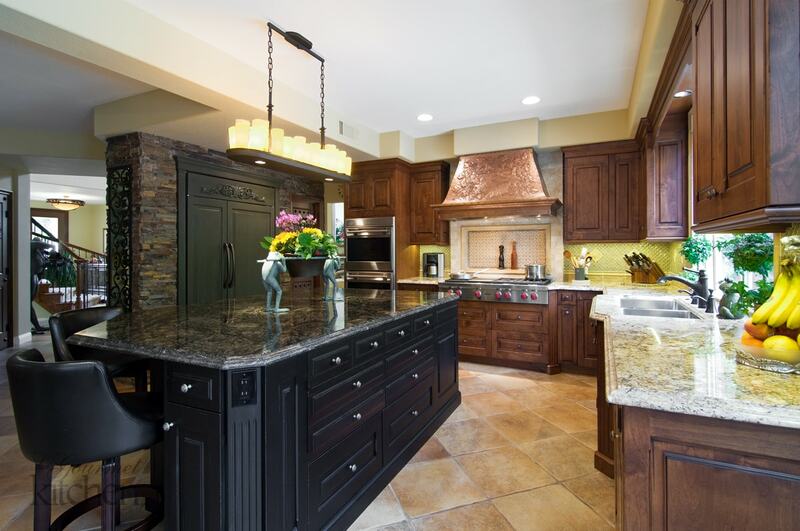 If you are lucky enough to have a large kitchen design, then why not include two islands in your kitchen remodel like the Yorba Linda kitchen design below? Prepare food at one and eat and entertain at the other. If your space is tighter, then guests can still sit at a small island or peninsula where you’re preparing food. If you plan on entertaining, then your island prepping area should face inwards to where your guests will be seated, instead of looking out a window. The seating you choose should fit in with the rest of your kitchen design. A traditional or farmhouse style barstool, for example, would not work well with industrial design. Then think about where you want guests to sit around your island. Barstools should be positioned far enough away from where you’ll be prepping but near enough to engage with your guests. Look at T or L shaped islands or bi-level styles that will provide distinct areas for guests to sit and dine while you prepare food in the work area. 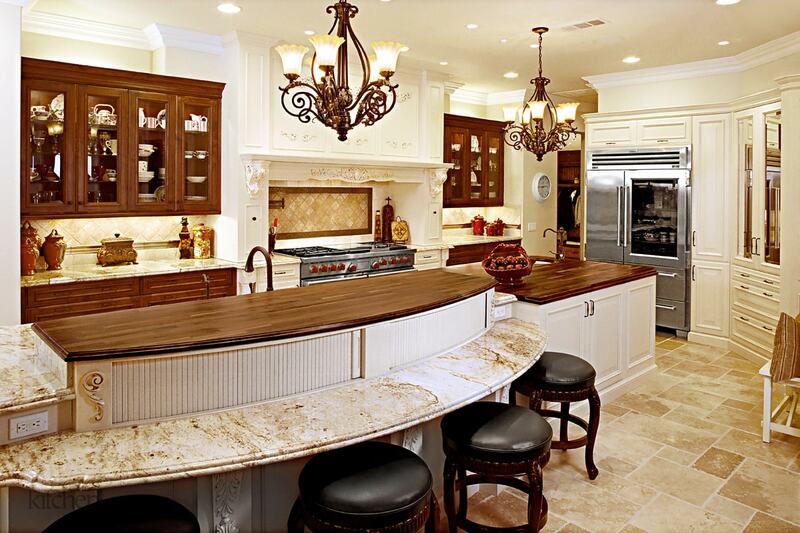 An island is ideal for mapping out work zones in your open plan kitchen design. One area is dedicated to preparing food and the other for eating it! At a party, you can easily work on one side and play on the other. Different materials help delineate island functions too. You could have a marble worktop for baking and food prep adjoining a wooden countertop designed for dining. 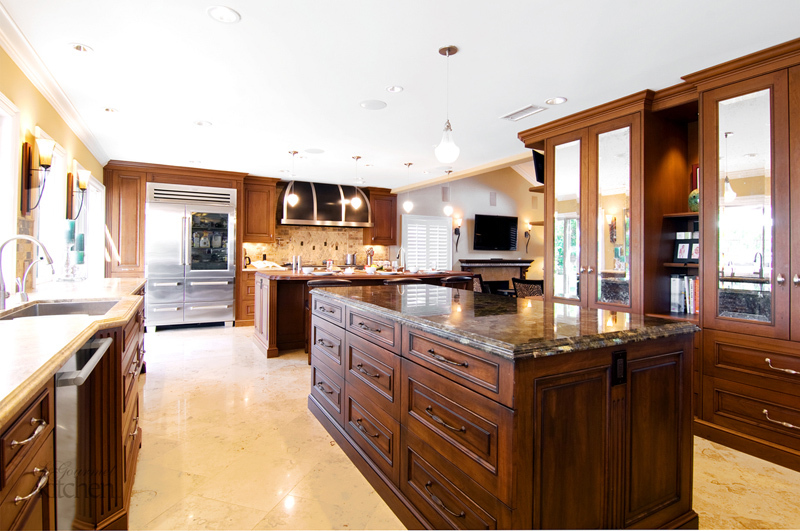 If you enjoy baking, especially during the holidays, why not include another oven or cooktop in your island? An extra microwave, dishwasher or sink would also be invaluable at a party, as would an undercounter refrigerator where you can whip out perfectly chilled wine from where you’re standing. Don’t forget about your small appliances, particularly those in demand during the holidays like the stand mixer. The island is the perfect place to include customized storage accessories for these small appliances. If you include enough storage in your island it transforms into a permanent home for your entertaining essentials like linens, platters, silverware and crockery. There’s a wide range of customized storage accessories to suit your every need. At Le Gourmet Kitchen we design stylish storage for everything from cookbooks and spices to wine racks and coffee machines, so all your holiday entertaining requirements are close at hand. 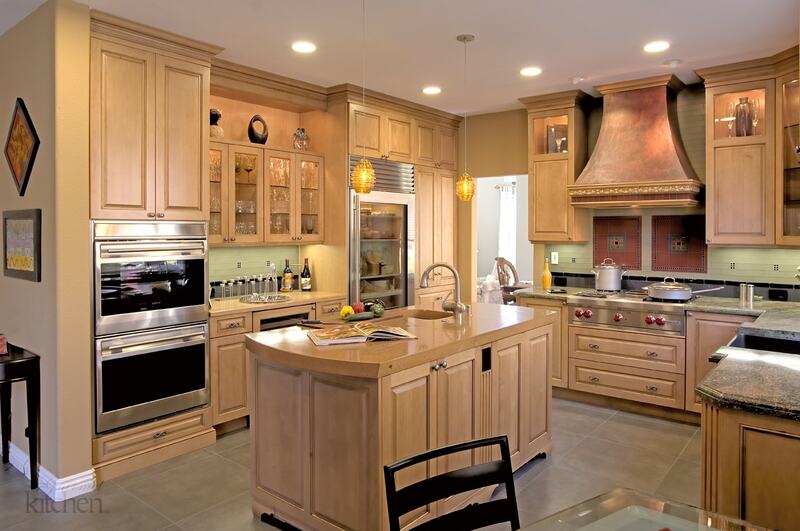 Your island serves many functions and is a focal point, so why not inject your personal style into it? Try eye-catching seating or glamorous lighting fixtures. Go with a color to contrast with the perimeter kitchen cabinets or make a statement with countertop materials, shape and levels. Think what you need from your island and design it for your unique lifestyle and to express yourself when you entertain. A kitchen island is a valuable addition to any kitchen design, providing extra storage, countertops and just about everything you could want when throwing a party, large or small. 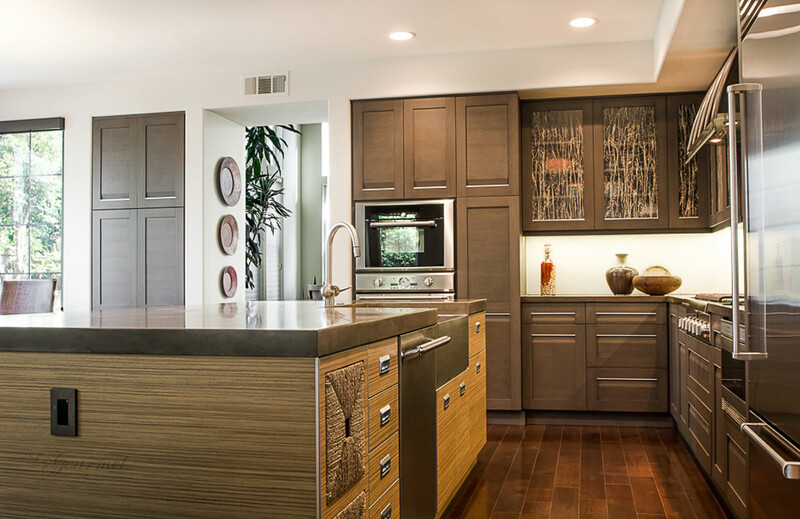 Check out our kitchen remodeling gallery for island design ideas and contact us today to get started on a show-stopping solution to your Orange County kitchen design entertainment requirements.